Cut the ham into slices and mix in a bowl with the ricotta, parmesan, chopped parsely, salt and pepper. Stuff the pasta shells with this mixtire. 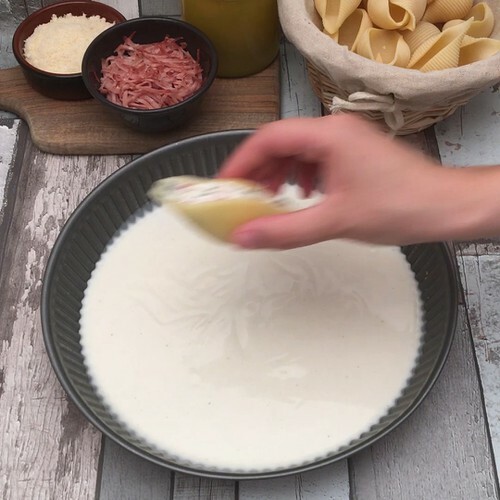 Spread the white bechamel sauce over the bottom of the pie dish and arrange the pasta as flower petals on the bechamel. Sprinkle the grated mozzarella between the pasta shells. Bake for 20 minutes at 190°C. Let it cool slightly before eating, by picking out the pasta shells one by one.